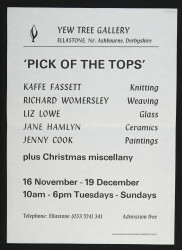 Leaflet and invitation for 'Pick of the Tops', an exhibition at the Yew Tree Gallery from 16 November to 19 December 1982 including work by Kaffe Fassett, Richard Womersley, Liz Lowe, Jane Hamlyn and Jenny Cook. The leaflet includes biographical information on each of the exhibitors. Printed by Saint Bernard Press, Mount Saint Bernard Abbey, Coalville, Leicester.